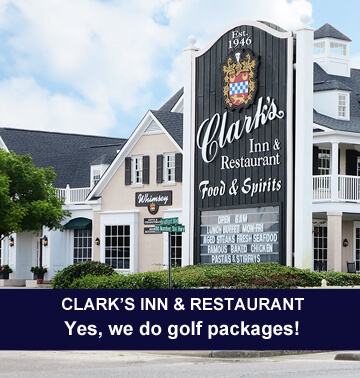 Our in-town packagers, Golf Santee, Santee Cooper Golf and Clark’s Golf Packages, provide excellent accommodations, magnificent golf courses, and true southern hospitality all nestled in the heart of the beautiful South Carolina Lowcountry, it’s no wonder that Santee has become a golfer’s preferred vacation destination. Optional UNLIMITED REPLAY ($10 additional) at Santee National. Stay in one of our recently updated guest rooms and enjoy our complimentary cooked to order hot breakfast each day of your stay. 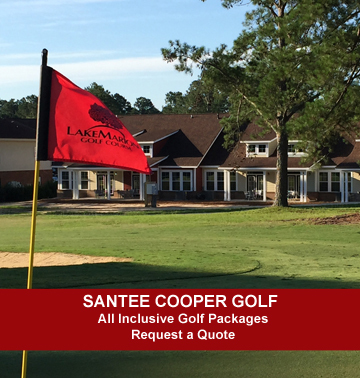 Play the many courses in the area including the “Big Three” – Santee National, Santee Cooper Country Club and Lake Marion. Call/ Email for a FREE quote! 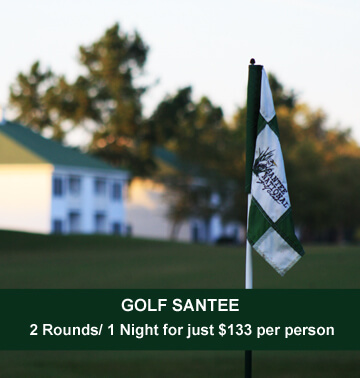 4 rounds of golf at your choice of Lake Marion, Santee Cooper, Santee National, Wyboo or The Players Course at Wyboo. 3 Nights at the Lake Marion Golf Villas with breakfast each morning of your stay. $50 Lake Marion/ Santee Cooper gift card, redeemable for merchandise and/or food and beverages. At least one dinner, depending on days of the week of your stay.